It’s all downhill from here, folks. Movie number 2, and I’m already at the best of not just the original trilogy, but the entire saga, and it’s honestly doubtful that even the new sequel trilogy will best the work put forth here. George Lucas still had some say in the story of The Empire Strikes Back, but this is the film that people point to when they want to point out how, even back then, less of Lucas was always a good thing, even if what his diminished presence improves upon is his own creation. Heck, even the subsequent retoolings couldn’t diminish the film’s quality – though sometimes they even improved upon it, as with the enhancements to Cloud City’s ambience and the insertion of Ian McDiarmid’s take on the Emperor in that holoconference scene between him and Darth Vader. 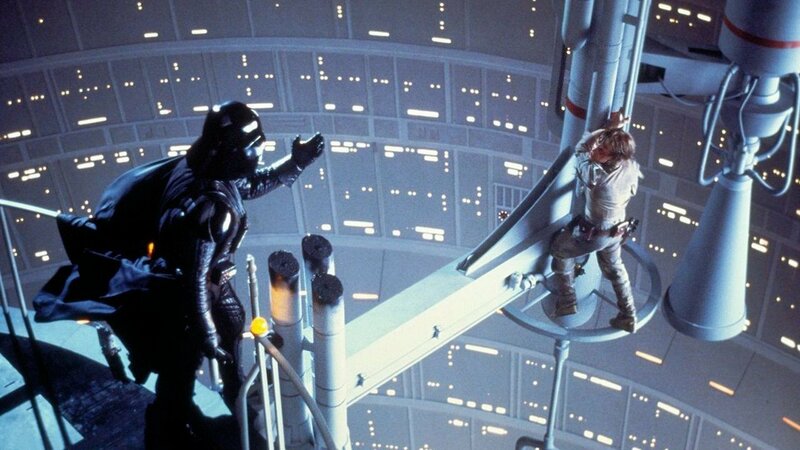 Let’s just chalk all that up to the fact that The Empire Strikes Back is just too awesome for its radiance to not influence any such reconfiguring. The film rejoins us with the heroes of the last film after a few years have passed since the destruction of the Death Star. Luke has grown in his ability to control the Force but is still far from completing his journey into becoming a full-fledged Jedi Knight, Han and Chewie have found themselves reluctant but able and willing supporters of the Rebel Alliance, Leia has grown in her authority and strategic skillsets in commanding the troops, and R2 and C-3PO are… well, pretty much the same as ever. Darth Vader, on the other hand, is feeling the pressure his Dark Lord Master has been placing on him to find and destroy not just the Rebels, but Luke in particular, who shows promise in reviving the Jedi Order they had worked so hard at eradicating. He’s growing in his anger and more desperate in actions and becoming more and more dangerous in the process. The film also introduces some new characters, apart from getting our first glimpse of the Emperor. This is where the tiny, wise Jedi Master Yoda makes his first appearance, puppeted and voiced by veteran Jim Henson collaborator/Muppeteer Frank Oz, a character who would go on to become almost synonymous with the “unassuming wise old master” trope. We also meet Lando Calrissian, a scoundrel-turned-businessman and both former associate of Han Solo and former owner of the Millennium Falcon. 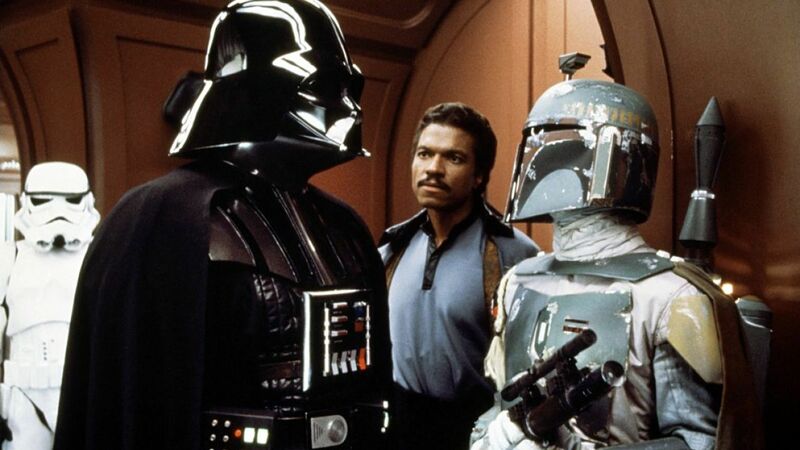 This is also the first time we meet Boba Fett (outside The Star Wars Holiday Special, which doesn’t… doesn’t count…), the badass bounty hunter and Jabba’s replacement for the ill-fated Greedo, who, as we all know, was just too self-confident to realize his target had already taken aim and shot first. None of that with Boba Fett, right? 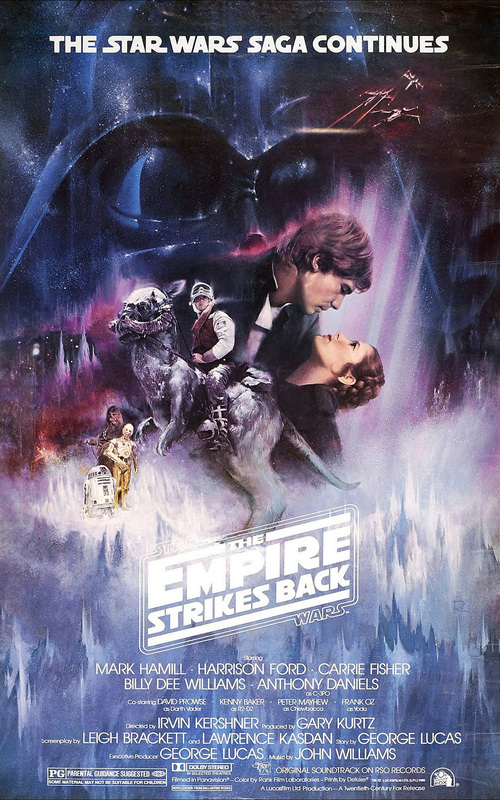 The Empire Strikes Back is one of those rare second entries that manages to not just repeat the financial success of its predecessor but also expand up on it and qualitatively rise above it. Thanks to the increase in budget, they were able to up the action and effects, and now that the core characters have been established, they’re also able to use the spectacle to expand the setting and story to fantastic new heights and grow the characters significantly through them, rather than stagnate by reworking the same formula from the first time around. The film might lack the famous Death Star run sequence, but it more than makes up for it with the spectacle of battle tactics displayed in the Battle of Hoth and the dramatic final battle between good and evil that reveals infamous untold secrets. Scenes with Yoda and Luke make the already mysterious Force seem all that much more fascinating. When a centuries-old little green man with backwards sentence structure pontificates and performs a feat like the one he does in the film, one can’t help but wonder about what further revelations there may be in store. Even the romance between Han and Leia is actually fairly entertaining, with the scenes presented only at naturally occurring moments and embellished with far snappier dialogue and subtler acting than what those who watch the trilogies in improper order might be prepared for. It helps that Han and Leia are also engaging characters on their own, unlike Leia’s dreadfully dull parents. You seriously can’t get any better a response to a declaration of love from your film’s resident badboy than Han Solo’s reply in this film. :) I deal with such information a lot. I was seeking this certain info for a long time.